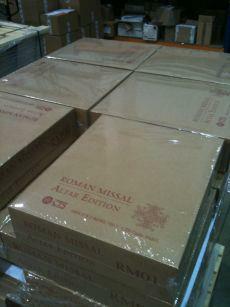 The CTS reports that the new Altar Missals are (nearly) packed and ready to go. They are being packed and labelled at a warehouse in Hampshire and will be despatched on 24 October. I received this news just now from the Catholic Communications Network (ccn@cbcew.org.uk) who recently emailed me to ask whether,as a Catholic blogger, I would like to be on their mailing list for press releases. Some of us have criticised the CCN in the past, so to give credit where it is due, I think it is a very positive development for the CCN to be in touch with Catholic bloggers in this way.